We’ve just experienced a double whammy! 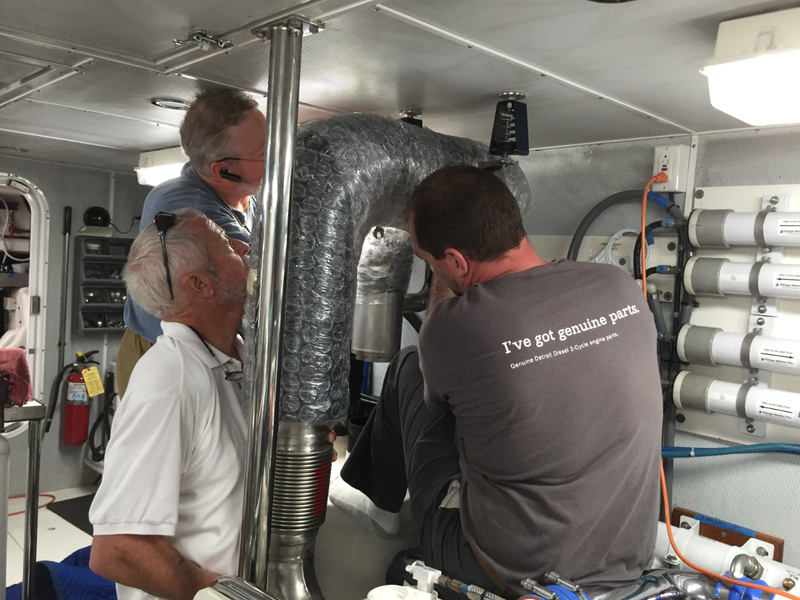 We were all set to launch the boat last week on May 5 when a subtropical depression made an appearance in the Bahamas. Though it had a low probability of developing into a tropical storm or hurricane, we decided to play it safe and delay our launch for a week. Good decision as it soon developed into Tropical Storm Ana and being safe in a boatyard was much better than in the water and exposed. So, we were all set to launch the boat this week when the 200-ton travel lift at Jarrett Bay developed a leak in a hydraulic seal, resulting in an unfortunate spraying of a beautiful Trumpy yacht with a whole bunch of hydraulic fluid during a lift-out. The lift won’t be repaired until Saturday, so we are delayed yet another week. You know you’ve been in the boatyard too long when birds decide to build a nest in your exhaust! At least we’ve had time to tidy the boat up a bit, verify our inventory of spare parts and such, and do a variety of lower priority projects. Bradley was able to do a quick trip to Florida to visit family while I traveled to Southport to visit my friend Nancy and a high school classmate I had not seen in many, many years, Lynne. 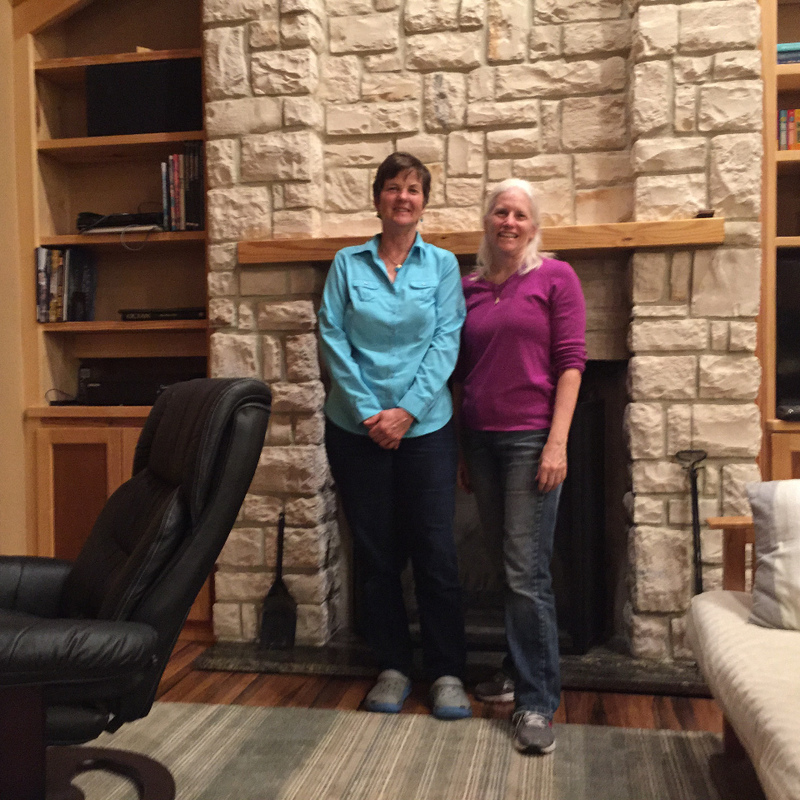 We had a great visit! 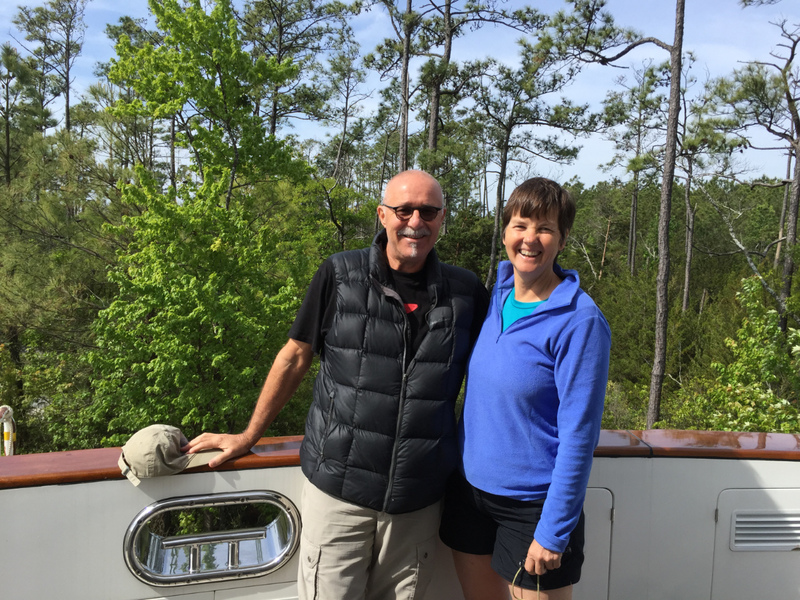 We also met up with John and Tina, owners of Sockeye Blue, a Nordhavn 75-foot EYF (Expedition Yachtfisher). 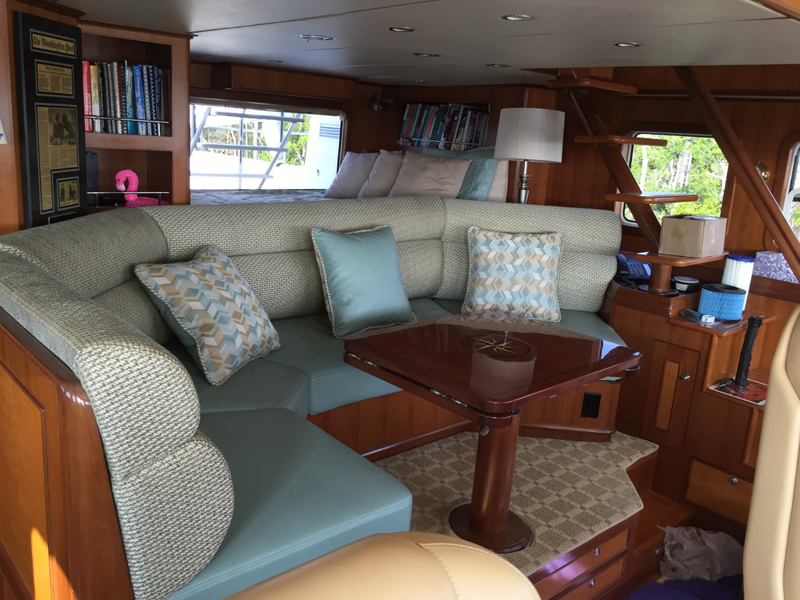 We had met John and Tina a few years ago at the Miami boat show when they had purchased this boat – a real project. Shortly after taking delivery, the original owner had a modification to the boat made in Mexico, which went horribly wrong, causing the boat to sink at the marina where it was housed. The boat was written off as a total loss by insurance and John and Tina subsequently purchased it as a salvage project. The entire engine room had been submerged in salt water, requiring new engines and all electrical wiring to be replaced. John and Tina were up to the challenge and have done an incredible job of bringing this boat back to life. It is absolutely spectacular! We enjoyed seeing them again and hope to catch up with them later this summer. 6. Fly Bridge Table – the finish on this table is very cloudy due to age and moisture but re-finishing it would be very expensive. We don’t like the table that much, so we will eventually replace it, but for now decided not to do anything. We will just use it as is for awhile longer. 7. We sold our Hobbie Kayak and replaced it with a newer version that has much improved seating and other upgrades. 8. Replaced some cushions we lost from Tender in the far north winds. 9. Replaced and upgraded some pillows throughout the boat. 11. 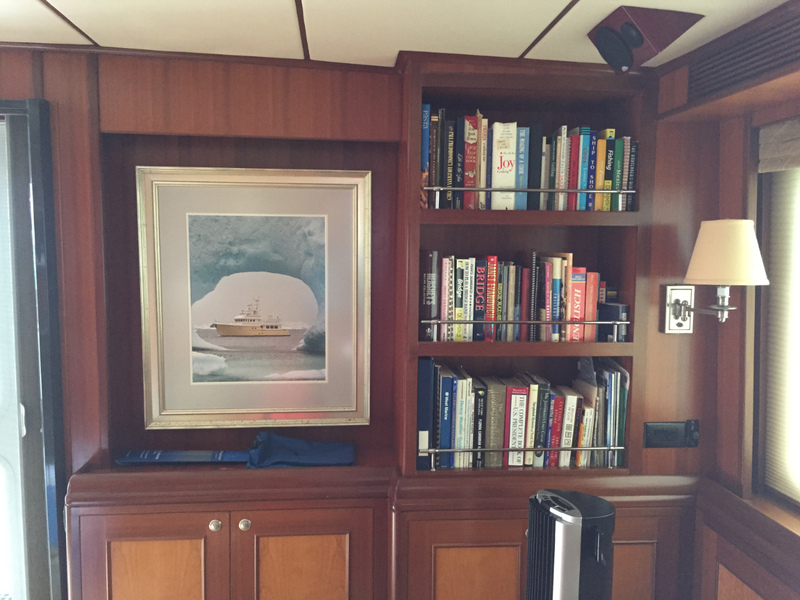 Artwork – the boat came with some lovely art prints of Venice. They were nice, but of no special meaning to us. So we decided to replace them with photos of some of our favorite adventures over the years. The hardest part was deciding which of more than 35,000 photos to use! One we agreed on some nice ones, I got prints made and found a local art gallery – Art & Things – to put the prints into our existing frames. 12. Engine Room Carpet – We replaced the old black mats in the engine room with nice new carpet designed for engine rooms. Engines & Generators. We have MTU Detroit Diesel 400 HP twin engines and two Northern Lights Generators. We have our generators serviced each 12 to 18 months when we visit Deltaville Boatyard, because we very much enjoy working with Neal at Deltaville. They also service the outboards on our engines. However, we prefer to have Keith at Western Branch Diesel here in Jarrett Bay work on the main engines. 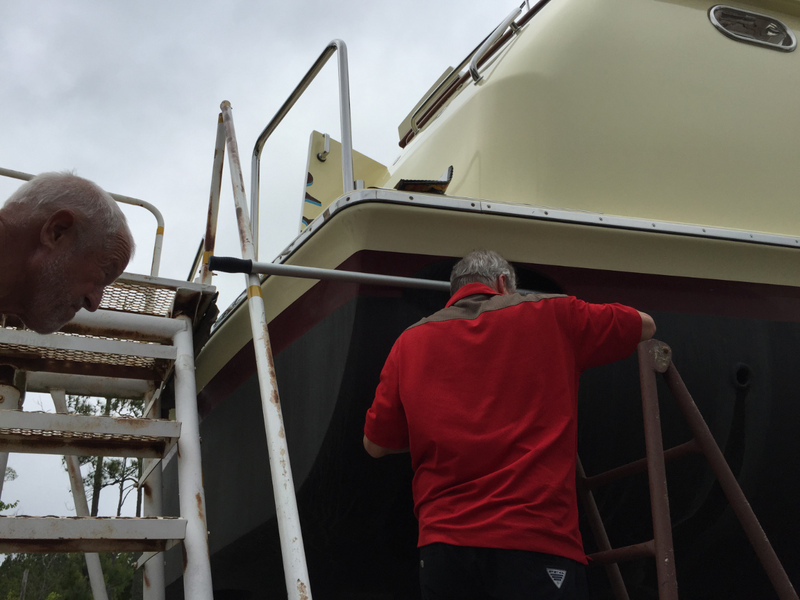 On our way to be hauled out, Keith jumped on board for a sea trial to review our engines and found several items in addition to the standard maintenance items, based on 6300 hours on the engines. The approximate cost of all the work on the engines including exhaust system was over $30K. 1. Exhaust Riser System. We knew prior to arrival this was the year we were going to replace the exhaust units. One of the key reasons we went to the Fort Lauderdale boat show in Nov. was to meet key vendors. After securing 3 bids and consulting with Steve D’Antonio, we selected Metcalf Marine. The only problem is they are located in Florida. After taking extensive measurements and pictures, we removed our old units and shipped them to Metcalf in Dec. They manufactured new ones and shipped them back to us several weeks early, the last week of Feb. So the first major job was to install the new units. Over all it went very well; there was one unit where we had to make a small modification to the vacuum break to have it line up correctly, but it turned out not to cost more than 1 hour of labor. The real test will come when we perform the sea trials. 2. Our fuel and water heat exchangers are mounted on the front of the engines. Keith noted the mounts had collapsed and should be replaced. This was not easy as it required we completely remove the units, remove the mounts and replace them. Working with Keith for most of the day, we successfully got the heat exchangers remounted. 3. We had a number of leaking pipes on the engines that were scheduled for replacement, which we integrated into the other repairs. 4. Charge Air Cooler Replacement – This is one of those “service opportunities” designed into the engines to keep MTU earnings up. It is recommended that the units be replaced every 4000 hours. We had 6300 hours on them, but they looked in good shape and we were not going to replace the units. However in the middle of this we received word of a fellow MTU owner who had his units tested with ~ 2500 hours on them, only to have one fail less than 100 hours later. The failure caused salt water to flood the engine. Total cost for that was ~ $125K, total cost to replace units ~ 9k. As Bob Senter likes to say, that is a service opportunity. This entry was posted on May 14, 2015, 7:53 am and is filed under Trips. You can follow any responses to this entry through RSS 2.0. You can leave a response, or trackback from your own site. Love the pictures of the Shear Madness and it’s operation. safe travels…once all the work is done. Such a lot of work! It’s beautiful! Now that Sheer Madness is all in tip-top shape, are you heading for northern waters again this year? It’s a brave woman that wears white pants to install engine room carpet. It is also great testament to the standard of the engine room that her pants appear to remain white. Randy and I were both out of town for the storm, but was wondering if it had impacted you. Sorry to hear of the delays. Safe travels.